Congress needs to know that the job of wolf recovery is not finished. Wolves occupy just a fraction of their historic range, even though there is plenty of viable terrain for them to inhabit (if given the opportunity). If wolves are ever going to truly recover, they need the ongoing—and unbroken—protection afforded by the Endangered Species Act. Tell Congress not to consider an uninformed, reactive response to a court decision that was based on science and careful reasoning. Write to your U.S. representative and senators, and tell them that you wish to see wolves conserved for future generations—allowed to fulfill their vital role in the ecosystem in which they cling to life. Anti-wolf bias, driven by illogical hatred and fear, has made protecting this iconic species an uphill battle. In a historic decision in December, a federal court ruled in favor of Born Free USA and several other plaintiffs to restore Endangered Species Act protections to gray wolves in the Great Lakes region. However, the court's clear and unequivocal mandate to conserve this vulnerable population with a consistent policy has not satisfied those who would blithely accept unfettered wolf slaughter. We have been told that members of Congress from Great Lakes states—Michigan, Wisconsin, Minnesota, and Wyoming—are drafting legislation to not only reverse the recent court decision, but to delist gray wolves across all of the lower 48 states. If they succeed, we will see barbaric hunting seasons return to the Great Lakes region, and wolf slaughter could also be permitted anywhere else wolves may roam. The state management plans we have seen in the past couple of years have been disastrous, with more than 1,700 wolves being mercilessly hunted, trapped, and hounded. 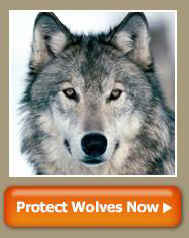 Congress needs to know that the job of wolf recovery is not finished. Wolves occupy just a fraction of their historic range, even though there is plenty of viable terrain for them to inhabit (if given the opportunity). If wolves are ever going to truly recover, they need the ongoing—and unbroken—protection afforded by the Endangered Species Act.